When I was a little girl, our family would go on outings, be it to the park, the State Fair or to Canton Trade Days, if you can imagine that. Being young and short, I took advantage of the closest view. The view unobstructed by legs and bodies and bags and purses. I always enjoyed the view of the ground. I so often saw little things of fascination. Pennies and other coins weren't uncommon. 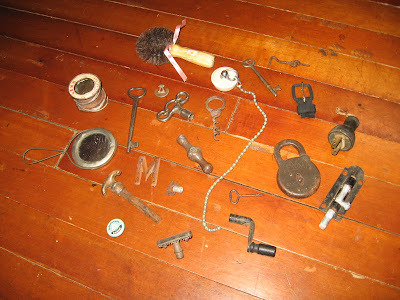 But, the bolts, Spam keys and shiny "trash" are what I really liked to check out. Mom and Dad were forever hollering "Mindy"! I'd eventually raise my head and catch up, and usually, I would be carrying a treasure with me. Here we are years later, and my fascination with smalls continues. In my home, I have a wire display tree on which I enjoy displaying the smalls I have found in my grown up days. You know. The things other folks might chunk without a second thought. 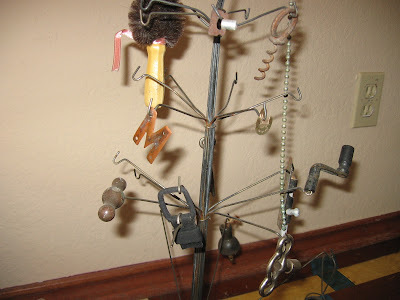 On the tree, you will find an old rusty corkscrew, the top of an old razor, a skeleton key, a clock key, a sink plug with chain, a screen door latch, an old belt buckle, faucet handle, an electric plug, the letter M and a pin touting "I'm sailing with Christ". Look and see. If you look close enough, you'll even see an old Spam key. And here, I find, is the time to finish the tooth story. For the extraction, I was awake and aware and sometimes, I could feel those exposed nerves. Two roots were expected. The tooth had 3 roots. One root was twisted and growing into the bone. Picture 5 foot nothin' me reclining in the chair, and picture the 6 foot somethin' big man hovering over my mouth that refuses to open more than about an inch or so. When it was all said and done, I think we were both ready to pop a hydrocodone. I made it home and popped a pill and checked my emails. It was then that I learned that a friend has decided no more chemotherapy for her. http://www.caringbridge.org/visit/deena She is at peace and knows the direction her life is taking. I think if we were to ask Deena, she would tell us to enjoy the small stuff. So, I will. I will laugh at this ace bandage hanging around my head, keeping the icebag in place. I will thrill in sleeping on my screen porch with 4 cats who want to "comfort" me by sleeping on the bed with me. I will rejoice to hear David's voice when he calls to check on me. You see? This stuff? It's all small stuff, little things. Kinda like the Spam key. I love it! Dang, Girl. That was a good post. Close to my heart in several ways...one, my sister has had ovarian cancer for ELEVEN years. Yes, eleven. She's fighting, but it's a tough fight. Second, I, too, love smalls. And your tree is darling. 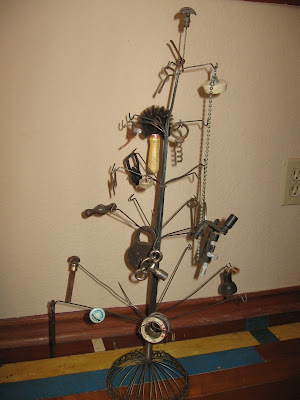 I think that will be my Christmas tree this year! I'm going to go get a tissue now and wipe my eyes and blow my nose. Darn good post! So true. Cherish the small things. My niece is a survivor of a childhood adrenal gland cancer diagnosed when she was 2. She will be celebrating her 9th birthday next month. I also have a friend who's 21 year old son has a rare malignant form of cancer and they are spending time together doing the small things that they can do together in the short time left to them as parents and son. You Texas girls got the junk thing down. I have visited Texas with my husband a few times in the past two years on his business trips and we both love it. I intend to visit again soon. Thanks for your good advice on smalls as that is one problem with the clutter issue I have. I will definitely put you on my list for frequent visits. Have a great weekend, P.